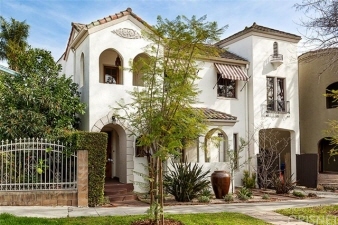 This uber charming larchmont village-hancock park duplex is in an excellent location. Its only minutes to hollywood, freeways and walking distance to the studios...Giving new meaning to the term "studio close." In fact, paramount studios melrose gate and raleigh studios is only a one or two minute walk. The property is perfect for anyone "in the business" who is looking for a great investment or place to live. There is an abundance of charm and character reflective of the period in which it was built. Amenities include: stainless steel professional grade appliances, hardwood floors, terra cotta tile floor in bathroom, dual sinks, backyard grassy area, indoor laundry, rear doors to each unit, upstairs unit with a bonus/reading room and more. You owe it to yourself to see this property. Don't delay. Please do not go on the property without the listing agent present.